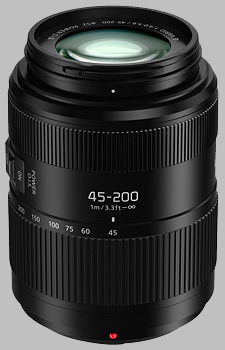 (From Panasonic lens literature) Easy to use in every way, this telephoto zoom lens is a must-have for your gear. Use the 45mm setting (35mm camera equivalent: 90mm) to take impressive close-up shots. For even more powerful zooming, use the 200mm setting (35mm camera equivalent: 400mm). The telephoto zoom lets you adjust the way you capture your images, depending on your subject and creativity. This lens provides well-balanced correction of various aberrations while producing high image quality. Taking highly popular MEGA O.I.S. further, this advanced technology immediately compensates even large camera shake and vibrations that may occur in photography. So you can capture true-to-life scenes without the need for a tripod. In the end, youll enjoy wonderfully crisp images. With video support any user has everything they need for recording with their LUMIX camera. Not only does it perform smooth aperture changes so there are no sudden jumps in exposure, it also boasts a silent design for enhanced capture of the scenes audio. Whats more, the stunning AF performance of this lens records excellent 4K video, where precise focusing is essential. 4.44x Optical 90-400mm eq. f/4.0-5.6 (3 ED). *The lens supports this feature in conjunction with splash/dustproof LUMIX cameras. The Panasonic 45-200mm f/4-5.6 II POWER OIS LUMIX G VARIO doesn't have any user reviews yet!